Sleep apnea is a particularly bothersome condition for a number of reasons. Chiefly, sleep apnea affects you while you sleep. It can wake you hundreds of times throughout the night, robbing you of quality sleep. Plus, you may not even realize that you’re waking up throughout the night. 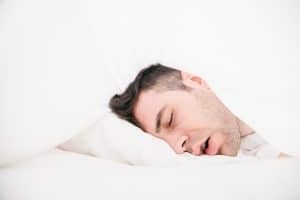 Adding to the annoyances, sleep apnea often manifests itself as snoring, so anyone nearby (or in some cases, even the next room over) can be adversely affected by the condition as well. Treating sleep apnea doesn’t have to be difficult. Your dentist actually has a simple solution that can help. If you’ve known other people that have dealt with sleep apnea, you may have seen the CPAP machines used in the process. These machines are designed to help keep your airways clear, but they can be loud and cumbersome. This hassle may turn you off to treatment for your condition. Instead, your dentist can often offer a customized mouthguard that counteracts the effects of sleep apnea. The mouthguard can create a shift in your airways that keeps them open throughout the night. Obstructive Sleep Apnea is the type of apnea that affects most people. It is so called because your own oral tissues (namely your tongue) create a blockage in your airways that prevents you from being able to comfortably breathe. Eventually, without enough air, your body will wake itself up so that you can breathe again. This can happen many times throughout the night without you ever regaining consciousness to understand that it’s happening. Sleep apnea solutions seek to prevent oral tissues from blocking airways. Since it can be difficult to spot sleep apnea as you sleep, here are some symptoms that you can watch for as you try to spot the problem. If you notice yourself waking up at night and struggling to breathe this is a strong sign that you may have obstructive sleep apnea. If you notice constant headaches and struggle to concentrate, especially in the morning, this can be the work of sleep apnea. A chronically dry and sore throat (often due to snoring) can be another telltale sign. If you notice signs of sleep apnea, talk to Dr. Roberts during your next appointment at Greenhaven Family Dental. Dr. Roberts can help you diagnose the condition, and in many cases, can provide a simple solution. Schedule an appointment at Greenhaven Family Dental in Baxter, MN by calling 218-454-0523.